The Washington Lease Termination Letter Form (20-Day Notice) is a legal document, designed to provide notice from a landlord that they are terminating their tenant’s tenancy. 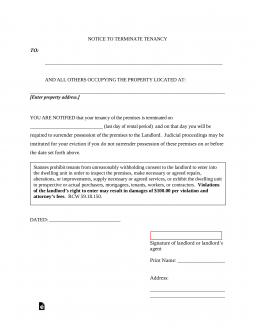 The document complies the Washington state law, providing 20 days notice to the tenants to vacate the premises and offers warnings of eviction if they do not vacate by the stated date. Landlord must enter the date of the last day of the rental period as the termination date. The notice must provide at least 20 days notice and must be delivered in a timely fashion to provide fair timing for the tenant(s) to vacate properly.